Backlit display and illuminated dial pad for easy viewing. Preloaded freeware that is customizable, and offers one-touch access to features and information. Built in full duplex speaker phone for hands free operation. Built in headset jack for the addition of an optional headset. Adjustable legs lifts phone viewing angle. Message waiting lamp and ring indicator lamp. Interactive Soft Keys to provide EZ feature operation. 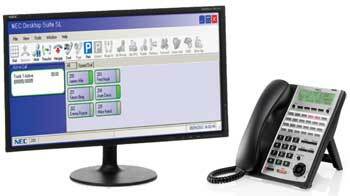 Programmable feature keys provide one touch access to co-workers and system features. Fixed feature keys for commonly used features. Available in a Digital or IP Models. NEC SL 24 Button Operator Phone for reception. A phone like this is needed for business when all coworkers would like to have the ability to see if they are on the phone or not. Phones with more buttons can provide access to one touch speed dials and system features if needed. Provides 24 programmable buttons for voice lines, coworkers, or system features. 12 Button NEC Office Phone. Your standard work station phone for the SL1100 for Large business. Also compatible with a business with the needs to see up to 12 voice lines. Provides 12 programmable buttons for voice lines, coworkers, or system features. Compatible with most later model NEC Phone Systems. Provides most of the same features as the NEC Office Phones. For the employee always on the go, can roam up to 300 feet away from base, base and charger are separate units, base can be mounted in most central position of roaming area, range extenders available, eight programmable buttons.